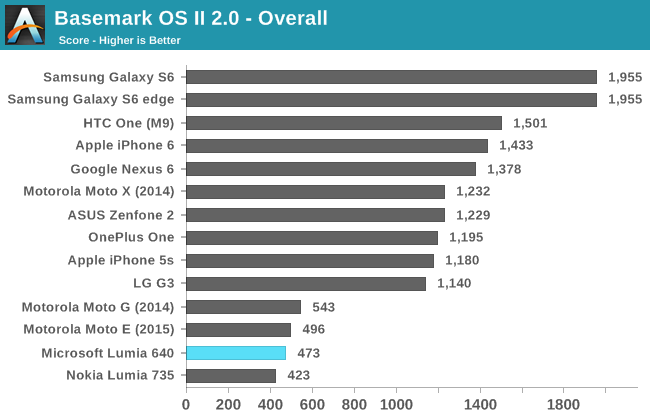 Since the state of benchmarking on Windows Phone is not as mature as Android, I haven’t been able to compare the Lumia 640 to the competition in every aspect that I would like to. What I have been able to do is put it through our standard browser benchmarks, along with BaseMark OS II to look at individual component performance, and GFXBench to examine GPU performance. 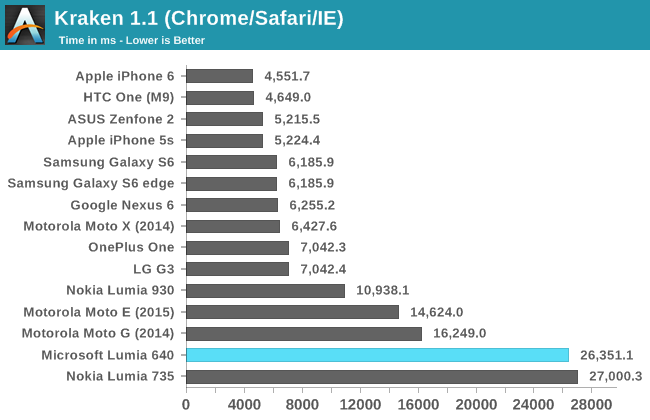 Unfortunately, it’s clear that Internet Explorer doesn’t measure up to Chrome and Safari when it comes to performance. 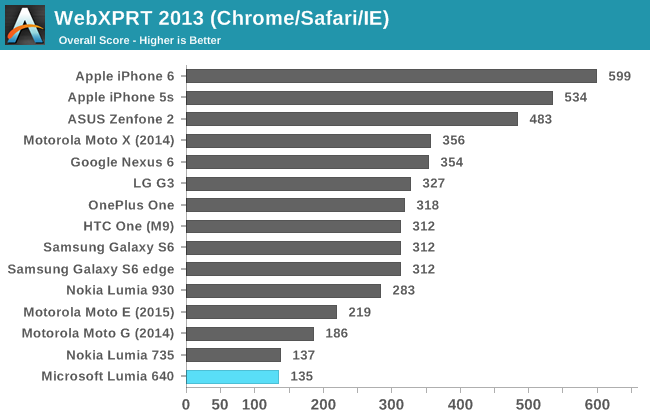 While buyers may be pleased that their Lumia 640 performs as well as the more expensive Lumia 735, both of these phones occupy the lowest positions on every chart. 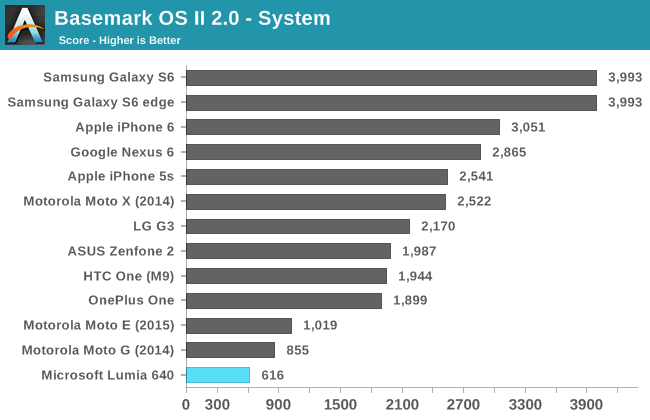 There’s even a significant gap between them and other Snapdragon 400 devices running Android, such as Motorola’s Moto G.
There's not much need to go into detail on the Lumia 640's performance in BaseMark OS II. 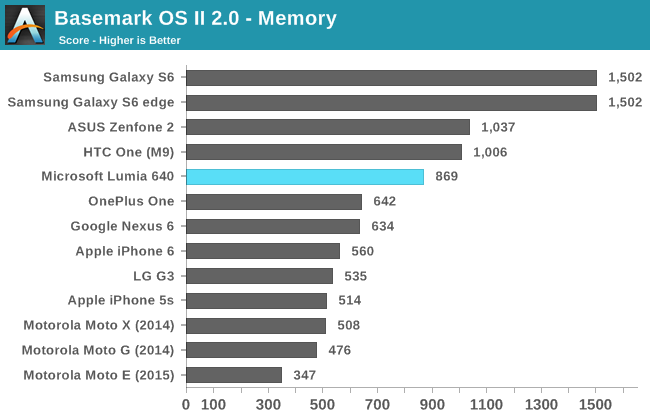 With the exception of a fairly good result in the NAND memory test, the Lumia 640 achieves the lowest scores that we've seen in recent times. Unfortunately, the Lumia 640 isn't shaping up to be a very quick device. 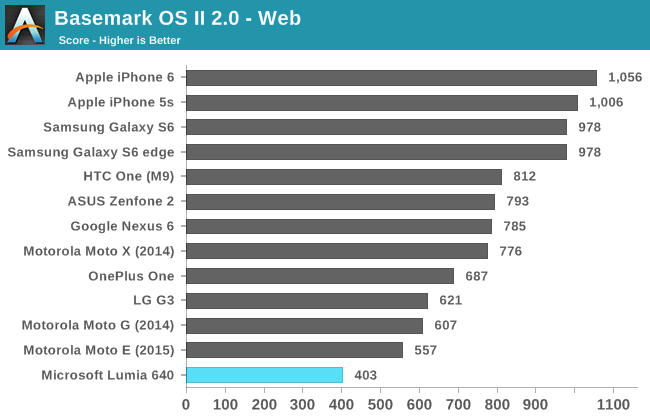 It's consistently bested by Snapdragon 400 devices running Android, and in 2015 we're going to see Snapdragon 410 used as the SoC of choice in devices at this price bracket, which won't make the Lumia 640's position any better. Microsoft needs to iterate much quicker than they currently are. Their slow pace in adoption new hardware helped kill Windows Phone in the high end market, and it will do the same to the low end. I have some further words about performance on the Lumia 640 and Windows Phone in general, but those will have to wait until the software section of the review. The last area of performance to investigate is GPU performance. 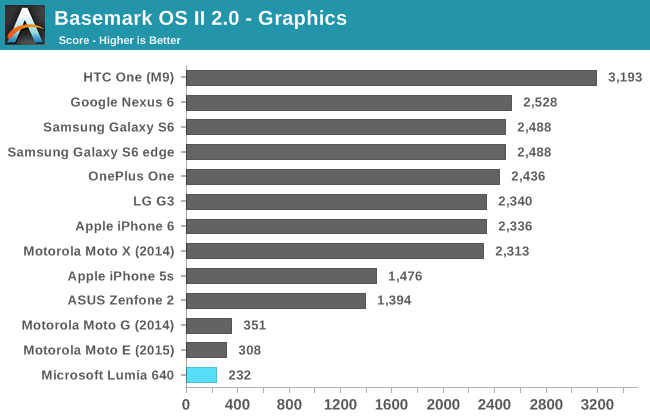 The performance of Adreno 305 has been thoroughly evaluated on Android, but differences in drivers and graphics APIs can improve or reduce performance across different operating systems. Since Adreno 305 doesn’t support Direct3D feature level 10.0 and Shader Model 4.0 it’s unable to run the GFXBench 3.0 Manhattan test. 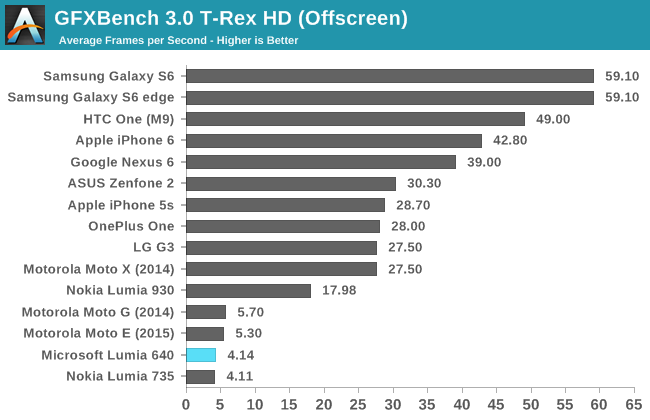 This leaves us with only the T-Rex HD benchmark which isn’t very hard on high end devices, but still poses quite a challenge for weaker mobile GPUs. In both the on-screen and off-screen tests, the Lumia 640 lags behind the Moto G. While 1-2fps doesn’t seem like much, when your frame rate is in the low single digits it represents a significant difference in performance. Because of this, I decided to take a look at the performance in GFXBench’s driver overhead test to see what impact the GPU drivers and graphics API might have on performance. 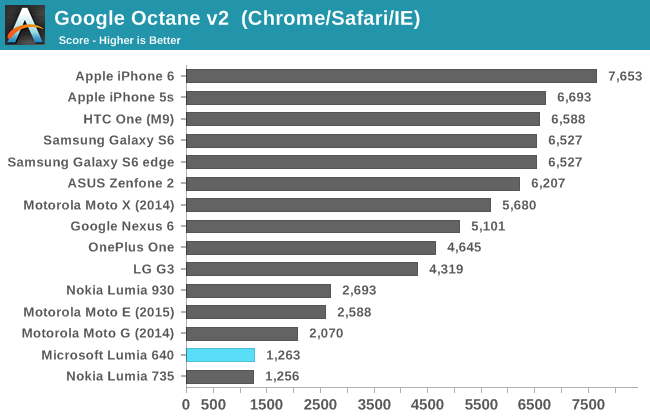 As suspected, there’s a very significant gap in performance when comparing the Lumia 640 to the Moto G. I can’t say whether this is due more to the differences between OpenGL and DirectX, or between the different Adreno drivers on Windows Phone and Android, but whatever the case may be the end result is a notable decrease in GPU performance on Windows Phone when compared to an Android device with the same SoC. 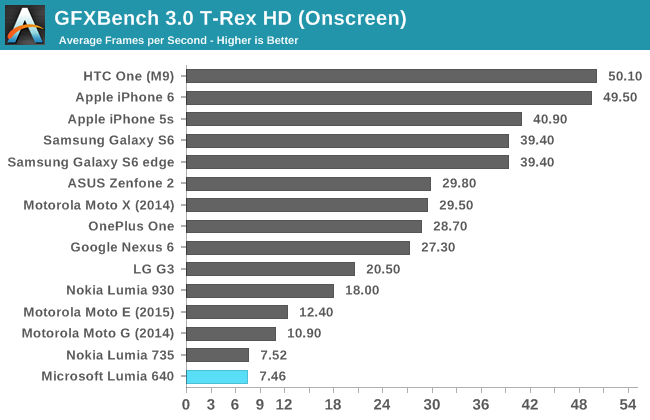 I’m not happy at all with the GPU performance that we see in low-end and even mid-range smartphones, and the Lumia 640 is no exception. There’s not much Microsoft can do here though, as moving to Snapdragon 410 with its Adreno 306 will not improve GPU performance at all. All I can really say is that users shouldn’t expect to be playing any 3D games on their Lumia 640, but simpler 2D games should run just fine.